1) Wash, peel, devein, and dry raw shrimps. Season with salt. 2) In a bowl, combine honey, lime juice, tequila, onion, cumin, and chipotle powder. Mix well and toss shrimps in marinade. Chill up to 30 minutes in the refrigerator. 3) Heat grill to 400 F. Make sure to oil the grilles well. Skewer shrimps in soaked wooden sticks. 4) Grill shrimps until bright or just opaque, about 2 minutes each side. Flip the shrimp skewers and cook for another 2 minutes or until they turn bright orange. Alternatively, you can also pan fry the shrimps. Set cooked shrimps aside. 5) Dice the avocados and squeeze juice from the remaining 1 lime. 6) Thinly slice the red cabbage using a sharp knife or a mandolin. 7) To make the dressing for the red cabbage slaw, put the lime juice, Dijon mustard, sea salt, pepper and oil in a jar or bowl. Whisk vigourously until it emulsifies. 8) Toss the red cabbage with the lime vinaigrette. Set aside. 9) Meanwhile, to make the chipotle crema, place the chipotles in the bowl of the food processor and give it a good whirl until it is smooth. 10) Stir in the sour cream or créme fraîche, mixing well until the colour is even. Transfer chipotle crema in a squeeze bottle. 11) To assemble the tacos, heat tortilla in a dry pan, about 1 minute per side or until lightly browned or charred. Wrap tortilla in a cloth to prevent from drying out. Set aside, covered. 12) Place some diced avocados in the middle of the tortilla, followed by the red cabbage slaw. 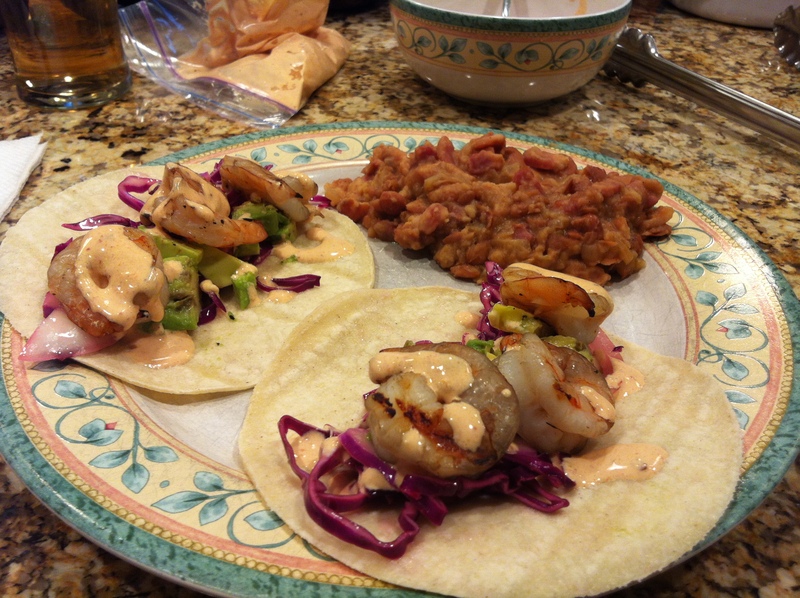 Remove skewers from shrimps and pile on the taco. 13) Drizzle with the chipotle crema and garnish with cilantro. Serve immediately.